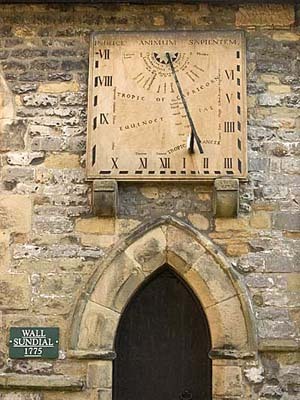 Eyam, famous as the Plague village, is in a beautiful setting, 800 feet above sea level, lying in the heart of the Derbyshire Peak District. 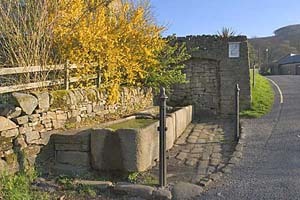 Eyam owes its location to the ready availabity of water. The rain water that accumulates in the hills to the north of the village, issues out of a series of springs down the one mile length of the village. 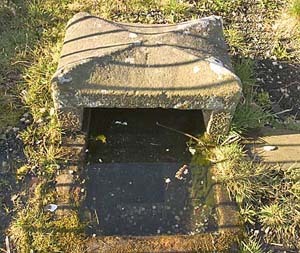 In 1588, 12 sets of stone troughs were built at convienient places in Eyam and the water was conducted to the troughs by pipes, thus making Eyam one of the first villages in the country to have a public water system. In 1665 the Plague was raging in London. A taylor from Eyam by the name of George Viccars ordered some cloth from the capital and it arrived damp and had to be laid out to dry. This released the plague carrying fleas and within days, Viccars fell ill and died. Several of his neighbours also died and some families began to panic and fled the area. William Mompesson, the rector, supported by Thomas Stanley, a former incumbent, feared that this would spread the disease over a wider area and asked villagers to quarantine themselves. Food and medical supplies were left at various points on the village boundary. 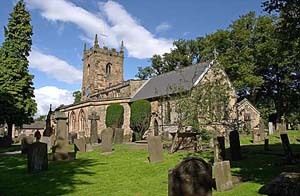 Eyam church was closed and services were held in Cucklett Delf, a valley nearby where a Plague Commemorative Service is still held annually. There were no funerals and families buried their own dead near their homes. At nearby Riley a Mrs Hancock buried her husband and 6 children in a space of 8 days. The Riley graves, as they are known, are still there. The Plague ended in October 1666 and had claimed 260 lives in an 18 month period. Some of the cottages now carry a commemorative plaque. 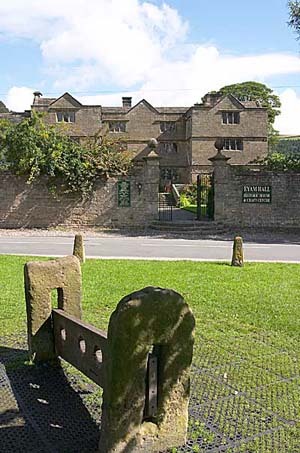 An authentic history of those fearful months is vividly told in the two floors of Eyam Museum which can be found near the coach park. The museum also looks at other aspects of village life in Eyam. Eyam has been involved with various industries over the centuries, including lead mining, limestone quarrying, agriculture, and silk and cotton production. These have all brought some prosperity to the village though sometimes at a cost of human misery. 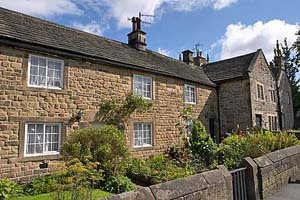 Eyam Hall has been the home of thw Wright family for over 300 years. It is a wonderful 17th century Manor House which contains an impressive hall and a tapestry room. 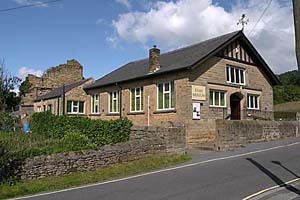 Here thre is also a cafe and gift shop as well as the Eyam Hall Crafts Centre which is housed in the farm buildings. The centre has a number of specialized craft units. 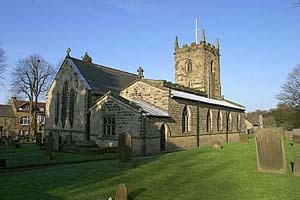 The Parish Church of St Lawerence partly dates from the 12th century and probably stands on a Saxon foundation. The North Aisle was doubled in width in 1868. The South Aisle was enlarged and a porch added in 1882. Various other restoration work was carried out in the 19th century. The church contains a chair that was used by the Rev William Mompesson, a Jacobean pulpit, a Plague register, a saxon font and a fine set of 6 bells, the oldest of which dates back to 1628. 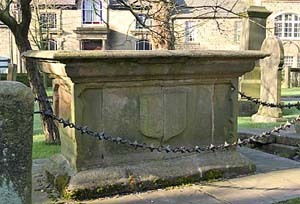 The churchyard contains various interesting tombstones and monuments including ones to Thomas Stanley and Catherine Mompesson, the wife of William. She had stayed in the village with her husband and died of the plague in its later stages. 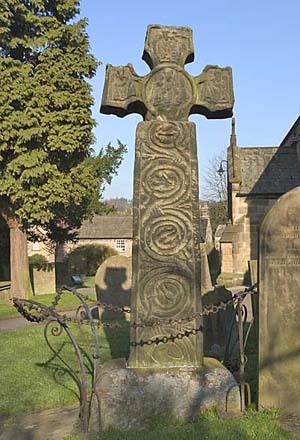 It also contains a magnificent Celtic Cross, one of the finest in the country and probably a wayside preaching cross from the 8th century. 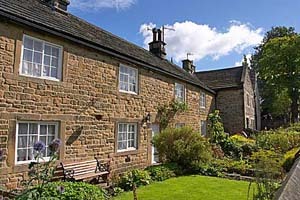 Eyam is a vibrant, active community. 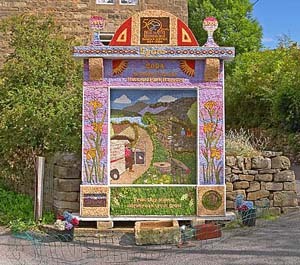 Some events that take place are Well Dressing, a Plague Commemorative Service, annual carnival and sheep roast and an annual village show.